Eyeliners are some of the most polarizing cosmetic items out there. It’s either you feel naked without them or you feel like they’re too much for your everyday look so you reserve them for special occasions. No matter what the case, though, you’ll definitely need the best waterproof eyeliner in your collection as they’re essential in creating a beautiful look. If you don’t know where to start looking, let this guide help you out. Not everyone realizes it but eyeliners are possibly the most transformative makeup items out there. One swipe and it can really change how you look. The funniest thing is, those who aren’t well-versed in cosmetics won’t even know what changed, it’s just that you look different with it. It’s really amazing how a simple liner can do wonders for your overall look. Who knew that the right lines in the right areas can easily enhance your appearance? But don’t think that this item is overly simple because not all eyeliners are made equal. 1. Eyeliners come in different formats and are made for various purposes. In general, there are four types of eyeliners: pencil, liquid, pen, and gel. Each tends to cater to various purposes and will let you create various looks. For example, pencil eyeliners are great for tightlining your lash line. They can help make your lashes appear fuller which can give the illusion of thickness. It’s great for everyday wear and the no-makeup look. Liquid, pen, and gel liners will all help you create more defined lash lines. They’re great for creating cat eyes since they can create really defined lines. As they’re also often smudge proof, you can count on them not to budge after application. When shopping for an eyeliner, you should keep in mind how you want to use the product you’re getting so you can choose accordingly. This way, you can get the best results for the looks you intend to create later on. You should also keep your convenience in consideration. Some products are just way easier for you to use than others and there’s really nothing wrong to stick with those. If you can’t get the hang of using other eyeliners, don’t worry. Practice makes perfect and if you can’t really master the strokes, tightlining with the best waterproof eyeliner pencil is always a great option. 2. Waterproof eyeliners offer longevity. A quick search for these products will give you a lot of results for water resistant eyeliner. This might seem odd for the uninitiated, but most people find them the best options. Why? They tend to guarantee longevity. As eyelids can get oily and foreheads can get sweaty, some eyeliners tend to fade out quite quickly. The humidity can also affect the staying power of most eyeliners, so if you don’t want to keep touching up your eye makeup, the best waterproof smudge proof eyeliners are good options. However, try to avoid products that are too hard to take off. If the best makeup remover wipes can’t get them off your skin, it won’t be a good choice for you. Aside from the fact that it might contain toxic ingredients that make it as long-wearing as it is, there’s also a good chance that it will hurt your skin. If it’s too hard to remove, you might end up using more force to rub them out. Then there’s also a chance that some of it won’t be removed and stay on your skin for long periods. Both of these scenarios are bound to hurt your skin, so it’s best to avoid them altogether. 3. Choose a shade that will bring out your eyes. Like just about any cosmetic product out there, eyeliners can also be found in a wide range of hues. Of course, you can always just opt for the basics and get blacks and dark browns, but you can also always experiment for some excitement. For this, though, it’s best to go with colors that will let your eyes pop. To find the shades that will work best for you, grab a color wheel and check out the hues that are in contrast with your eye color. This will ensure that your eyes will be brought out by your eye makeup. Of course, you can also get eyeliners in different colors. A lot of people tend to have a collection of eyeliners so they can jazz up different looks with various shades of eyeliners. Since they’re relatively affordable and are practically the size of a pen, it’s not too much of a hassle to have a lot of them. The most efficient home makeup organizers can already help you keep them in order and easy to find. 4. Consider your skin sensitivities. If you have skin sensitivities, it would be best to be very particular about the eyeliner you’ll get. This way, you can minimize the odds of reacting adversely towards a specific product. Make sure to check the ingredients of the item you’re considering to get so you can be sure that it doesn’t contain anything that can irritate your skin. Last but not the least, make sure to read the reviews about the product you intend to get. Eyeliners may not be pricey enough for you to feel like you need to make the most out of your purchase, but it will still be a shame to end up with an awful product nonetheless. So, to make sure that you’ll get your money’s worth, make sure to get to know what users are saying about the item you’re interested in. 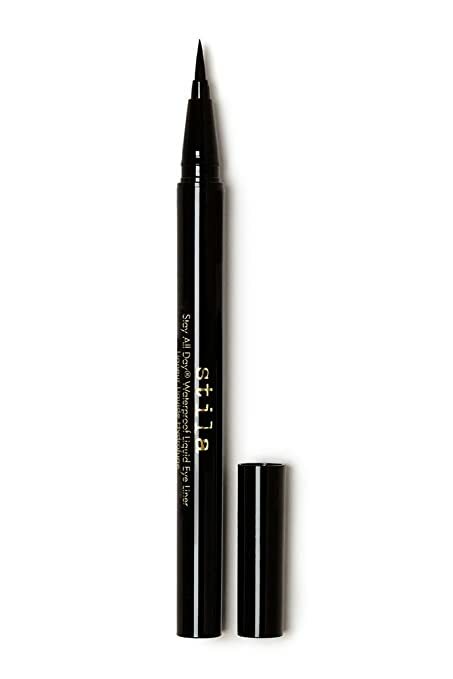 Considered as a holy grail product by a lot of people, the Stila Stay All Day Waterproof Liquid Eyeliner is definitely worth checking out. If you’re interested in the best waterproof pencil eyeliner, it’s a solid contender for the top spot. With thousands of folks more than happy with its performance, there’s a very good chance that you’ll end up satisfied with its offerings as well. But what exactly can this product do? This eyeliner pen offers the performance of liquid eyeliner but with the ease of use of a pencil. This alone already makes it worth a closer look as it can definitely let you create various looks without breaking a sweat. Thanks to its quick-drying formula, it’s definitely an eyeliner that doesn’t smudge. It dries up super fast so there’s no chance for it to smudge or feather. This makes it very easy to work with, no matter what kind of lines you might want to create. Because of this, it’s also guaranteed to stay in place all day long, keeping you from having weird dots of color on your eyes at the end of the day. It also won’t transfer on the upper parts of your eyelids, in case you have hooded or semi-hooded ones. This product also goes on very smooth. It promises that there won’t be any skipping when lining your eyes, so it’s very easy and efficient to use. With an experienced hand, you might not even need to go over the line repeatedly to achieve your desired results. So if you only need to tightline your lids, this can make things easier for you. Available in 11 colors, you can also take a pick or even get this item in multiples. They can all guarantee to help jazz up your look as the colors are all beautiful. Eye makeup is definitely all about the drama and the Maybelline New York Eyestudio Lasting Drama Gel Liner certainly knows what they’re offering. You can still easily wear it on a daily basis, though, as it’s quite versatile. Touted as the most intense formula from the brand, this product is also often considered as the best smudge proof eyeliner in the market today. With its oil-free formula, it gets to dry faster and stay waterproof for up to 24 hours. It also guarantees that it won’t budge after application. Another strong point of this product is the fact that it’s tested to be safe for the eyes. It has been tested by ophthalmologists so you don’t have to worry about it irritating your peepers. You also don’t have to worry about wearing it with contact lenses as it’s also safe to use with such. Adding color to your waterline is a tricky thing but the Maybelline Makeup Unstoppable Smudge-Proof Eyeliner can make it work. This is why it’s hailed by lots of users and professionals alike as one of the best waterproof eyeliners for the waterline. With its waterproof formula that’s guaranteed to stay in place after application, you don’t have to worry about it melting or budging if you apply it on your waterline. It won’t give you ‘raccoon eyes’ after a few hours, so you can use it to add more definition to your eyes. With its performance, it’s also considered as the best drugstore waterproof eyeliner pencil. It’s long-wearing, smudge proof, and can be used for various looks at a very friendly price. It’s also tested safe for your eyes, giving you more reasons to give it a try. The Mia Adora Unshakeable Eyeliner may be the last in this list but it’s definitely not the least. This best-selling product is deemed by many as the best waterproof eyeliner for them for its ease of use and great performance. As a liquid gel eyeliner pen, it’s definitely a high-performance and versatile cosmetic item. It can help you do various lining techniques with great ease, so it’s certainly worth a shot. As it’s also formulated to hold up against sweat and humidity, it can definitely be a good choice for everyday wear. Its fast-drying formula helps it stay put right after application, making it a very efficient choice for a lot of folks. The price is also very friendly. It’s a nice budget option if you’re after a liquid pen eyeliner. It’s important to note, however, that the felt tip can dry up rather quickly. Some say that it can dry out while you’re still using it, so you might need to shake the pen occasionally to keep the felt tip wet at all times. The Mia Adora Immovable Waterproof Eyeliner Pencil with Sharpener is another notable item for being a smudge proof eyeliner pencil. As this type of eyeliners tend to budge, melt, and feather easily, finding a formula that can stay put for the duration of your day is a great thing. While its claim that it won’t move even after rubbing your eyes may seem hard to believe, this product still gets to deliver great results, thanks to its good formula. It stays on for 12 hours or so, depending on how watery your eyes can get. Another stand out point about this product is its rich pigmentation. It’s very easy for its color to show, so a little goes a long way.